Exactly what it says on the tin. 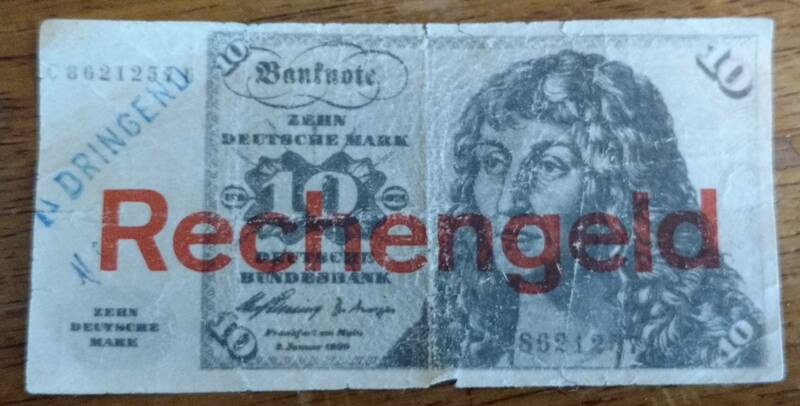 This is clearly a German 10 mark note of some kind, but I can't find pictures online of any notes like it. The reverse is completely blank, with some bleed-through from the "DRINGEND" stamp. The white balance on my camera is rather off, and the note is actually far more yellowish than the photo implies. What era is this note from? What is the meaning of the stamps? 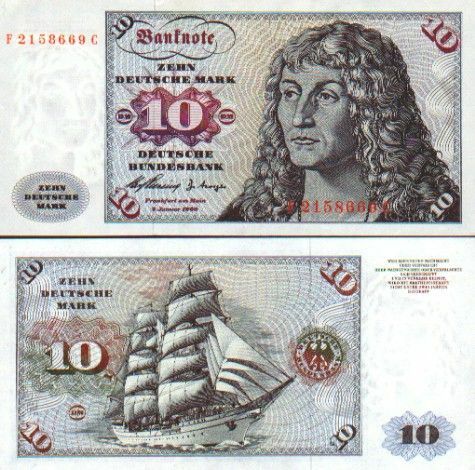 The design is that of the "sailing ship" 10 Deutsche Mark note, a banknote first issued in 1960. The front features a 16th century painting by Lucas Cranach the Elder. On a real version of the note, the reverse would have depicted the German navy sailing ship Gorch Fock. These notes were withdrawn from circulation in 1990. However, in your case the RECHENGELD stamp denotes that it is only play money, used for educational purposes according to @Loong in the comments. Which also explains why the reverse is blank. This is the 10 D-Mark note of the third edition of the Deutsche Mark, the Gemäldeserie BBk I (1961) (painting series). It was designed by the swiss designer and artist Hermann Eidenbenz who was living in Hamburg, Germany. The red "Rechengeld" stamp means that it is money for children to learn using cash. The blue stamp "Dringend" only means "Urgent", I do not know what purpose it has. To all anglophones: It is Deutsche Mark, D-Mark or even shorter simply Mark, not Deutschemark or Deutschmark or....simply stop it, ok? Yeah, I know how it is called in English, but it was always grating to German ears. Not the answer you're looking for? Browse other questions tagged germany identification currency or ask your own question. What exactly is this 1795 German “Berichte” Document? What is this household object from early 1900s rural Russia? What kind of knife is this and where is it from? Can someone identify these German ww2 badges? What kind of knife could this be? What is this German/Italian badge?